Thu., Dec. 30, 2010, 5:08 p.m.
A man prepares to climb to safety after fire department rescuers threw a rope down to him near the underside of the Monroe Street Bridge on Wednesday. Spokane rescue crews used a car from the Riverfront Park Skyride to bring a man up from the river’s edge near the Monroe Street Bridge on Wednesday afternoon. Patrons at the Spokane Public Library reported seeing the man in the river. By the time fire crews arrived at the bridge, he was sitting on the bank, fire officials said. 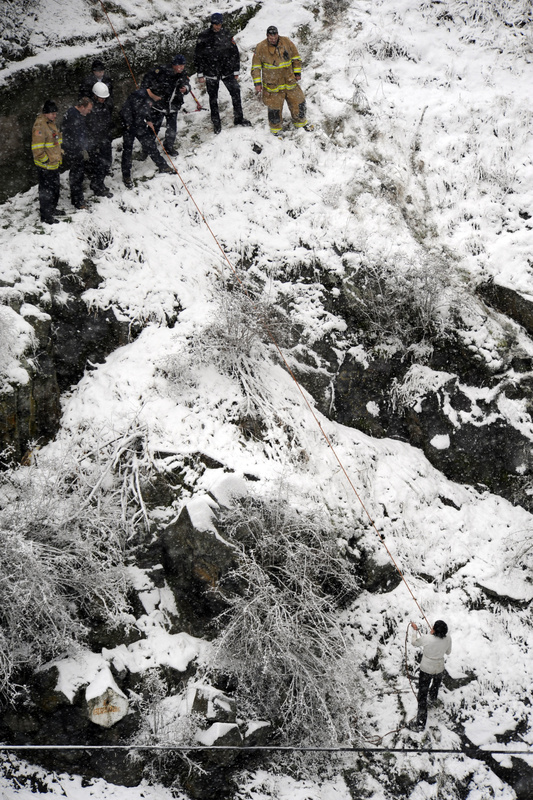 He was unable to climb up the hill, leaving crews to use a gondola car to rescue him. Posted Dec. 30, 2010, 5:08 p.m.